This is a small Tree, rising to the Height of about sixteen Feet or upwards, with a slender Trunc; the Wood hard and brittle, from the larger upright Stalks grow smaller ones horizontally and opposite to one another, on which are placed the Leaves by Pairs, shaped like those of a Pear; At the ends of these smaller Stalks were also placed the Flowers, growing usually two or three together on Footstalks of about an inch long. These Flowers are composed of four white Petals, adorn'd in the Middle with a Tuft of thrummy Stamina, a Triple Stilus, and crowned with yellow Apices. These Flowers are succeeded by round mucronated Capsulas, containing many small Seeds in Cells divided by thin Membranes. The only Tree of this kind I ever saw, was growing on the Bank of the Savana River near its Cataracts. These Plants are always supported by Trees and Shrubs, on which they creep and clasp with their Tendrils, the Leaves are long and narrow at both Ends; they are thick, stiff, and shining, with a single Rib in the Middle, and are set alternately at wide Distances. At the Ends of the smaller Branches are produced hexapetalous greenish white Flowers which grow in umbelliferous Tufts, and are succeeded by globular mucilaginous red Berries, each Berry containing a very hard round Stone. 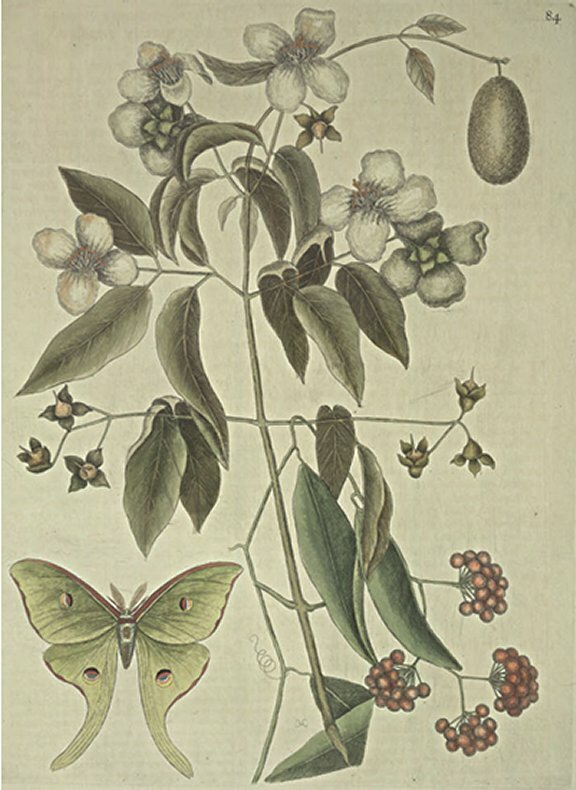 These Plants with their glittering Scarlet Fruit, and by retaining their green Leaves, make an elegant appearance all the Winter, at which Season the Berries serve as Food to Thrushes and other Birds, and the whole Plant as a warm shelter for them in that cold Season: They grow in Bogs and watery Land in Carolina. The Body of this is dusky white, except that near the Head, is a transverse Stripe of Copper Colour, its Legs are Copper Colour; the Antennae broad pointed at the Ends, and pinnated; the Ground Colour of all the Wings is greenish yellow, the upper Edge of the two upper Wings are verged with Copper Colour, as are the exterior Edges of all four Wings: In the Middle of every Wing is a Spot resembling an Eye, the Sight of which is transparent like lzing-glass; the Place of the Iris is a white Border below, and a red one above, joined to a Lift of black of equal Length. The singular Form of the lower Wings seem to distinguish it from all other Butterflies. The Chryssalises of these Flies are found in Winter hanging pendant to the Twigs of leafless Trees of an oval Form and silky Consistance. These Flies are found in Virginia, Carolina, Maryland, and Philadelphia, &c.